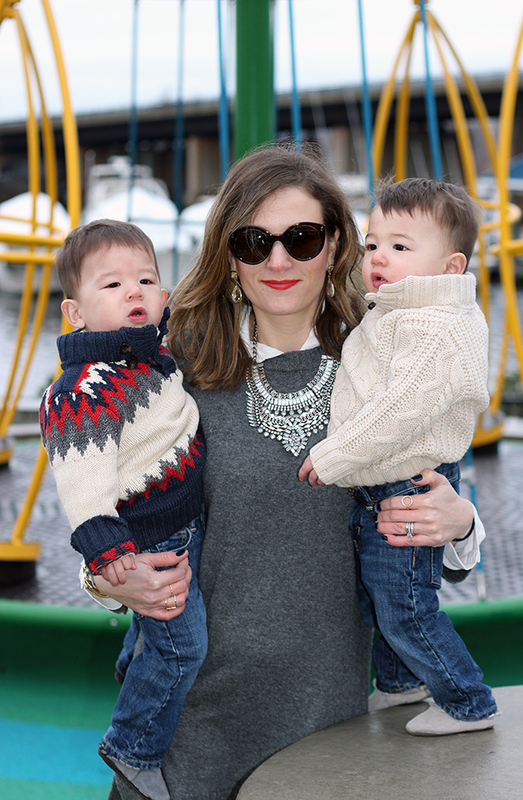 What happens when you wear all of your most loved clothing pieces at one time? Well, you get the perfect outfit, or at least that's how I feel about this look! These faux leather pants have been a favorite of mine this season, as you may have known because they've been on major repeat on the blog, last seen here and here. You can even see that they've become a little stretched out with all the wear, as they're supposed to fit more like a legging, but I have to admit I'm digging the slightly relaxed fit. This Vince cardigan is beyond cozy, and I'm not lying when I tell you that I wear it just about everyday. Plus, is there anything more classic than a chambray shirt? 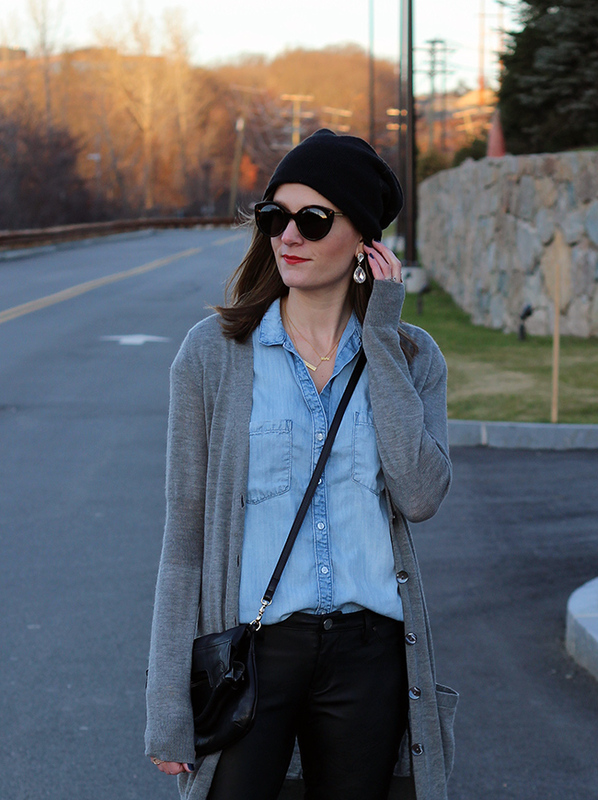 All of these pieces are classics, but together with a pop of red, they make one of my favorite outfits, and I couldn't think of a better look for my last outfit post of 2015! However, I can guarantee you that you'll be seeing plenty of these items in the year to come! Does everyone have fun New Years Eve plans? Mine will be on the low key side, but I'm excited. We are headed back up to the lake, to my sister's, for a dinner party. My brother and sister-in-law will be joining us, and I finally get to meet my nephew who was born a month ago! Since my brother lives in Vermont, I haven't had the chance to visit since the baby was born, so I'm beyond excited. Plus, I love when all of our kids get together, and can't for the twins to have quality time with their cousins. On New Years day we are all heading up to Killington, VT for the weekend to celebrate Chrismakkah and New Years with the rest of the family, so it will be a fun packed weekend. I wish everyone a very happy New Years and thank you for reading. Happy Monday everyone! I hope you all enjoyed the holiday. Mike, the twins, and I spent our Christmas up at the lake. It was nice to spend the whole weekend with my sister since I hadn't seen her since she moved to the lake. The holiday was a blast, and I think I ate and drank my weight in food! I'm trying to be good for the next four days, as we'll be heading back up there for New Years Eve, to do it all again! I can not wait. 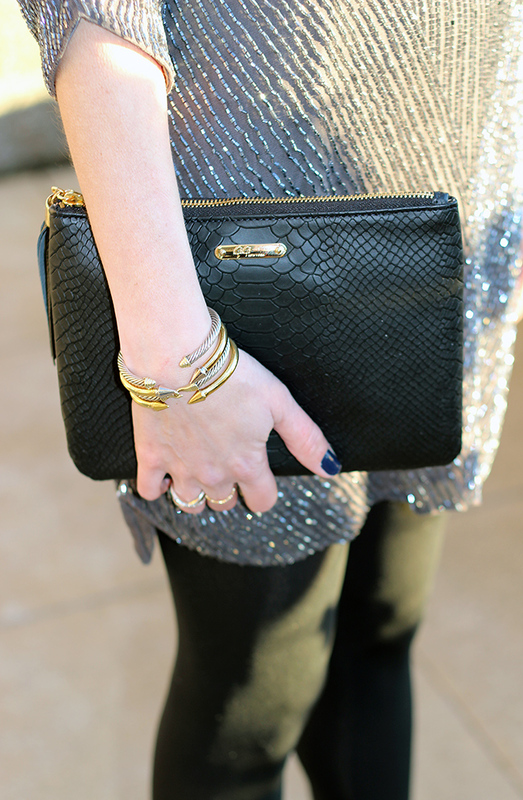 Speaking of NYE, today I'm sharing a look that's perfect to ring in the new year. 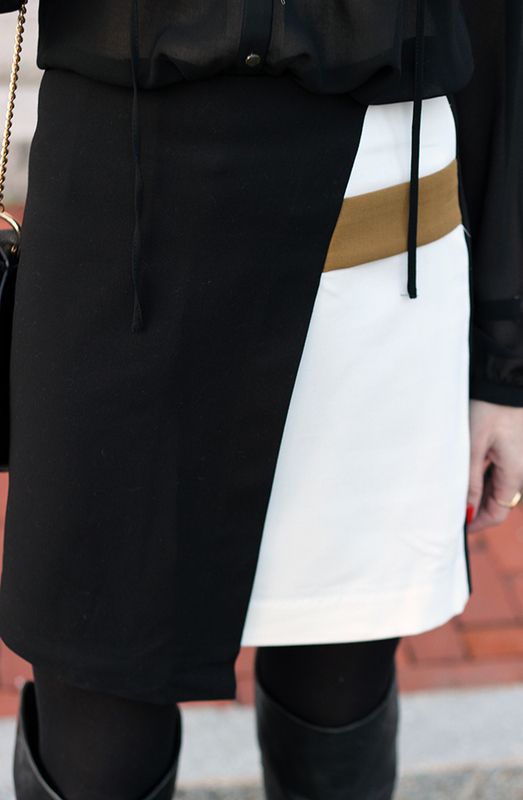 Both my skirt and coat are from Chicwish, which has recently become one of my favorite online sites to shop. 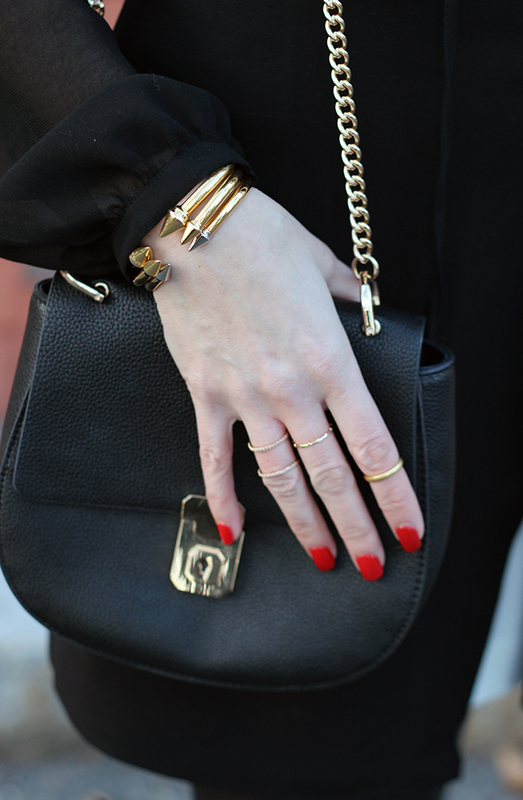 They offer trendy pieces at affordable prices, and most of the items look more expensive than they actually are. Not only do I love Chicwish's selection of coats and dresses, but they have an amazing selection of midi skirts, and I fell in love this with striped lace one. It's the perfect piece to dress up for the holidays, but it is also basic enough that I can wear it with a tee shirt on a daily basis. Nothing screams glam more than a faux fur coat, and this off-white one makes the perfect finishing touch to my New Years outfit. 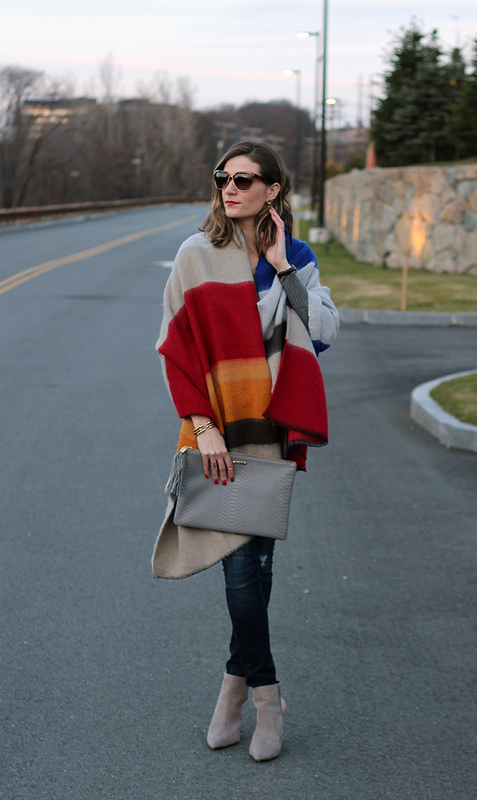 I love how I can also throw this coat on over my jeans for an instant put together look. Thank you Chicwish for partnering in this post. All thoughts and opinions are my own. One thing a lot of people may not know about me is that I wear glasses. I only need them for watching movies (distance) and driving at night time, so I don't wear them very often, especially around others. However, during the holidays there is a large chance that I'll be at a party where games will be played and I'll have to read cue cards at a distance, or end up to having a movie night with my family, so it's important to me to look stylish while wearing my glasses. 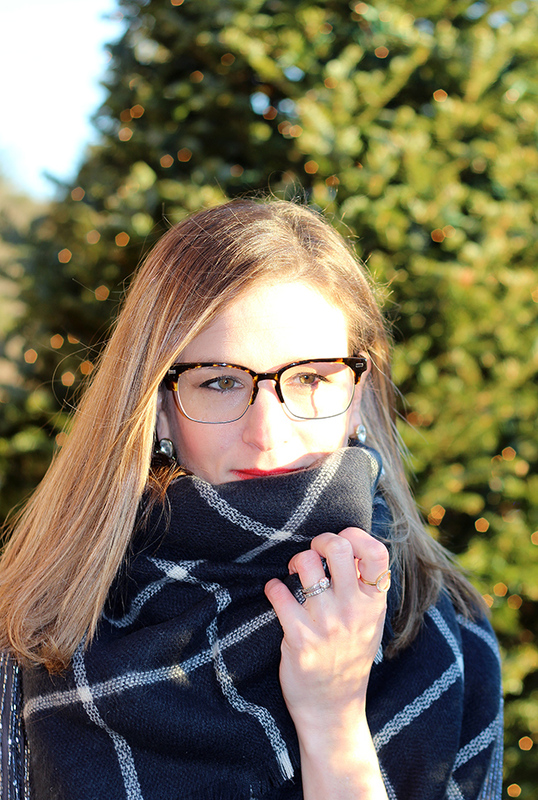 I was actually on the hunt for a new pair as my prescription recently changed (for the better, believe it or not), when Warby Parker contacted me to try out their winter collection. They couldn't of reached out to me at a better time, so I decided to take advantage of their Home Try-On Program. This allows you to choose five frames from their site, that are then shipped to you, so you are able to try them out in the comfort of your home, and it couldn't of been easier. All I needed to do was log onto their website, pick out the five frames I wanted to try, and they were at my door in a matter of days. You have five days to test out the frames, then you simply order the ones you like and send back the samples, all free of charge. Warby Parker sells both frames and sunglasses, so of course I had to try a couple of sunnies too! I fell in love with the Batten Sunglasses, and Ames frames. What do you think? If you're looking for the perfect New Years Eve dress, I highly suggest checking out Parker. The brand has always been my go-to for dresses, especially when it comes to something a little sparkly. The dress I'm wearing is a couple of years old, but they still make a similar version which I linked below. Plus I linked some of my other favorite Parker dresses too! I'll be taking the rest of the week off from blogging to enjoy time with the family and have some quality baking time in the kitchen. I'll be in Boston through Christmas morning, then Friday afternoon the boys and I will be heading up to the lake to be with the family. Thank you for stopping by, and I wish everyone who celebrates a very Merry Christmas. See you all Monday! 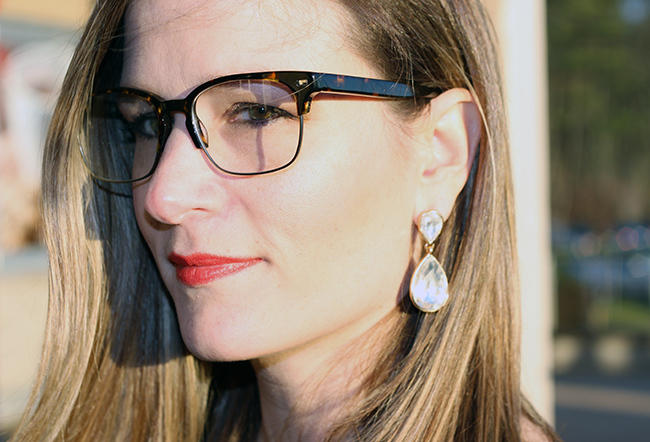 Thank you Warby Parker for partnering in this post. All thoughts and opinions are my own. Happy Monday! Is everyone as excited as I am that Christmas is just four days away? Now that the twins are at an age where they get somewhat excited about special occasions, I can't wait to see their reactions on Christmas morning. Although I don't want them thinking Christmas is all about presents, now that they actually know what a present is, it will be fun to see their little faces light up after Santa comes. Today I'm sharing with you the outfits we will be wearing on Christmas day, and happy to be teaming up with five other amazing women to share our mommy and me holiday styles. In our family, we like to dress on the casual side for the holidays, as comfort is a crucial factor with all the food and treats we consume! However, it's important to me to still look put together, which makes a sweater dress a perfect option. I found this dress at Bloomingdale's and love that it has the faux shirt underneath. All I have to do is throw on my boots, and I'm ready to head out the door. I completed my look with a statement necklace for my ideal put together, yet comfortable, Christmas outfit. 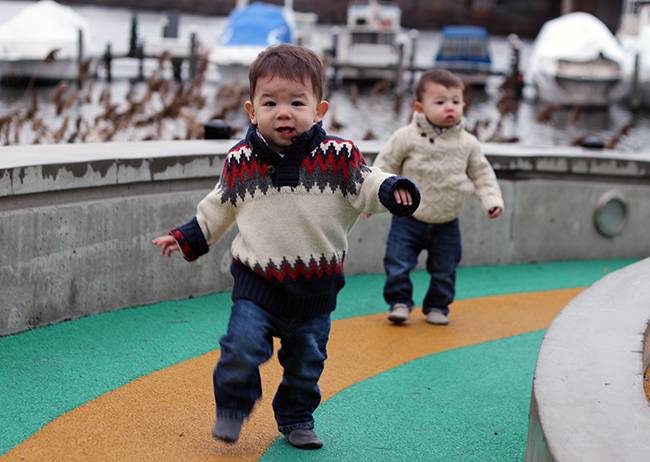 I also love how dressing the twins in nice sweaters can elevate their look, and these coordinating ones from the GAP are perfect for the holidays. 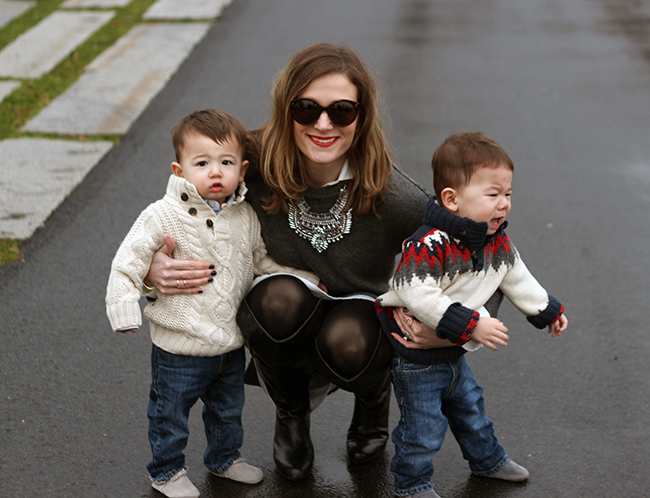 Make sure to stop by the other blogs for more great mommy and me holiday styles! I found this dress on major sale for $37! Although I only bought it last week, it is no longer available online. I'm sure you can find it in store, but I've also linked some similar options below. 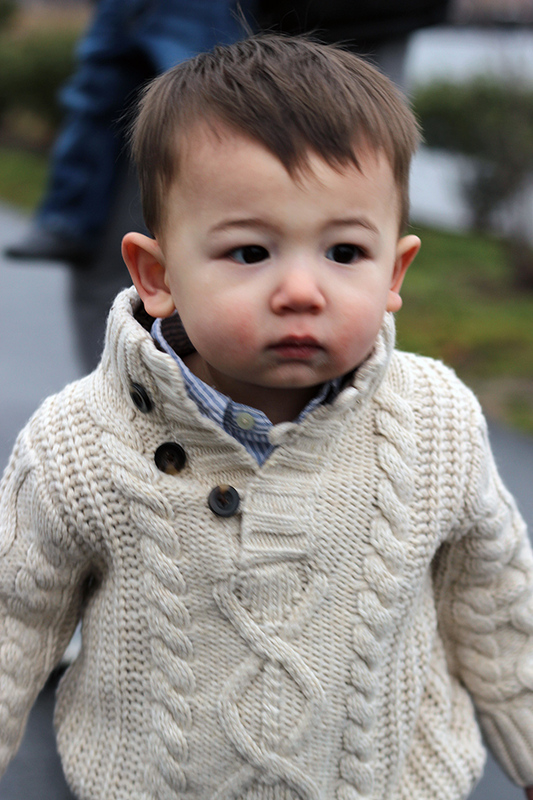 Sweaters: both GAP (here and here)| Jeans: GAP| Shoes: Freshly Picked. I can't even tell you how hard it was to take these photos! It was impossible to get these boys to stay still or even look at the camera, but they do crack me up! Have a great week, and thank you for reading! Happy Hump Day friends! Can you believe Christmas is just nine days away?! This year I'm a little behind, and have barely done any of my holiday shopping. I don't know why I'm procrastinating, but time is flying, so I better get on it. Today I'm sharing a look that can work for a holiday party, but is also casual enough for everyday. I found this color block skirt at Forever 21, and love the mix of black, white and camel. 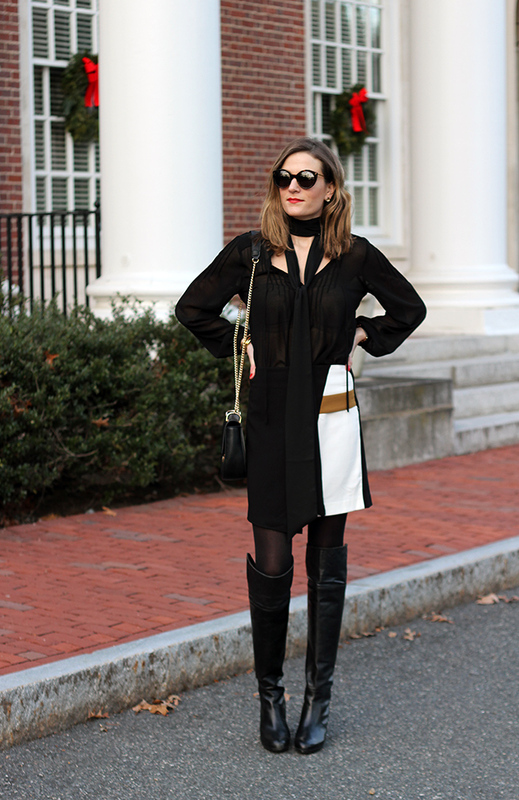 Paired with a semi-sheer blouse, long neck tie, and over the knee boots and I'm ready for some holiday fun! On a side note, I just want to say I've been loving Forever 21's Contemporary Collection. I only become a fan of the brand a few months ago, as I always thought it too young, and to be honest, cheap looking. However, they have really stepped it up a notch with their contemporary line. Not only is the fit better, but the collection looks more expensive than it is, especially when paired with great accessories.